and being surrounded by the glow of holiday lights. I just love it! and sugar cookies. If I have time I'll also make gingerbread men and toffee crack. 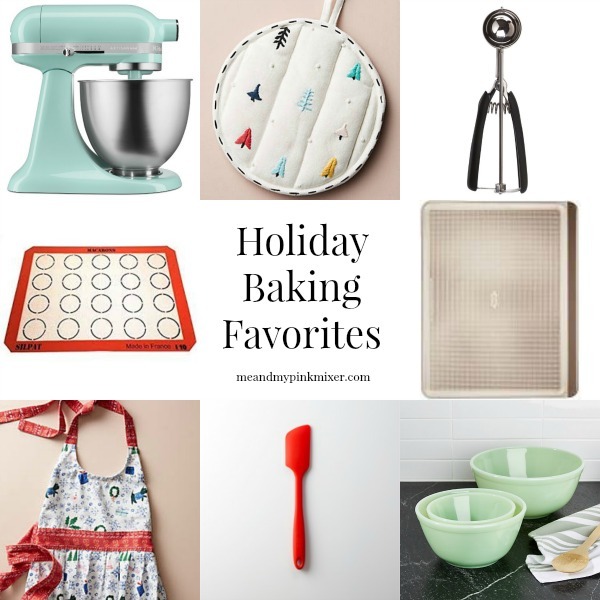 Now for my holiday baking favorites! KitchenAid Stand Mixer - my all time favorite kitchen tool! Cute pot holders - this one is from Anthropologie. OXO Cookie Scoop - works like a charm! Silpat Baking Mat - keeps cookies from sticking to the pan. OXO Baking Sheets - bakes perfect cookies every time! Cute aprons - I love this one from Anthropologie! Gir spatulas - my absolute favorite spatualas! Glass Mixing Bowls - I don't have these jadeite glass mixing bowls, but I wish I did! This is not a sponsored post. I'm just sharing things I love.